HONG KONG—Jointly organised by the Hong Kong Sailing Federation and the Royal Hong Kong Yacht Club, the Hong Kong Race Week 2015, incorporating the ASAF Youth Sailing Cup, was hosted at RHKYC Middle Island. The event took place over 6 days from Feb 12 to Feb 17, 2015 and attracted 207 entries with more than 240 competitors from around the region and from as far away as United Arab Emirates and India. Day-1 was a practice day. Weather condition varied considerably from day to day. On Saturday Feb 14, the opening day of the competitions the weather was sunny and windy, Sunday was also a challenging day, but Monday was very poor visibility with no wind and sailing was cancelled. On the final day Tuesday Feb 17, the morning was rather grey and misty, but this cleared as the day progressed, the wind picked up and sunshine appeared in patches. Four different race areas were used to cover the various boat classes, spread out along the Hong Kong south coast off Repulse Bay and towards Stanley with the bigger faster crafts travelling the longer distances. 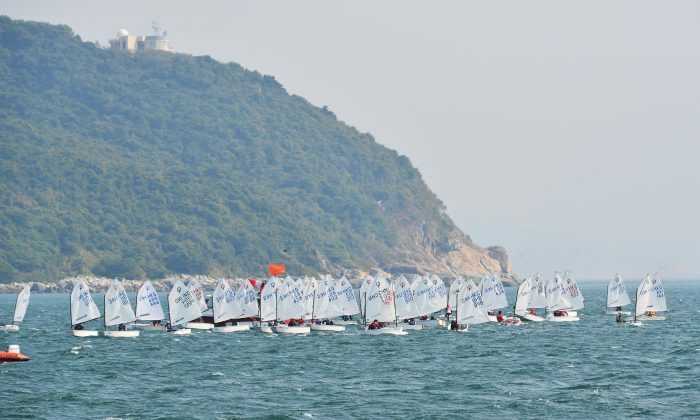 Competitors in Optimist Green class competed within the confine of Repulse Bay while the Optimist Class raced a little distance along the coast. Laser 4.7, Laser Radials, 420’s and 470’s sailed a course further away from the coast. The 29ers and Hobbies were seen heading to a more distant location. More than 70 boats took part in the Optimist Class which ran a total of 7-races over the 3-days of competition, using the low score system and allowing 2-discards. There were just two races on the final day with the second of the races split into two parts, the first (the Medal Race) being contested between the leading 10-boats in the series with the remaining fleet starting after the leader boats were clear on their final leg. The 10 Medal boats scores for the race were doubled that is 2, 4, 6, 8 and 10 and the rest of the fleet’s scores start at 11 and continued in consecutive numbers from that point. This doubling of points in the Medal Race had a significant effect in the final standings of the top 10 boats. The final positions in the Optimist competition was a win for Aniketh Rajaram of India finishing on 17 points, equal to another Indian competitor Chitesh Tatha also on 17-points, but placed 2nd on count back. Hong Kong contestants took the next 4-places with Nancy Highfield 3rd, Thorwen Uiterwaal 4th, Dolf Hendriksen 5th and Taylor Young 6th. The racing in these events count for the second leg of the ASAF Youth Sailing Cup a 4-series completion of which the first was in Chennai, India in December 2104. The next event will be held in Singapore on March 17-21 and the final one for this competition will be in Abu Dhabi on April 8-11. The Optimist Green class was contested by 29 contestants, all of whom were from Hong Kong. Three RHKYC sailors took the first 3-places with Kinsey Long finishing 1st, James Truhol 2nd and Jake Hopkins 3rd. Antoine Piras of ABC Yacht Club finished 4th and Tang Hoi Ching of HKSSA was 5th. Hong Kong Sailing Club J. Asia took 6 of the top 10 places in the Laser Class. Nicholas Bezy finished 1st, Marian Williams came 2nd, Hsiu-Chu Huang was 3rd and Emma Fung of RHKYC was 4th. The next four places were taken by Preston Tso, Christopher Bezy and Molly Higfield. Nethra Kumanen of India won the Laser Radial Class event followed by Riley Cameron (J. Asia), Malik Hood (RHKYC), Hsiu-Chuan Chang of Taiwan, and Pierre Bureau (RHKYC). Double handed classes included 29er, 420, 470 and Hobbie 16 and comprised entries of up to 10 contestants. Yann Therry d’argenlieu and Nathan Bradley (ABC) headed the 29er Class followed by Ferdinand Heidman and Leonardo Giustiniani (RHKYC) and Wang Haoran and Yang Xuezhe (China SYC). The 420 Class was won by Calum Gregor and Hugo Christensson, followed by Wang Yam and Tam yu hin (HKSS) and Chi-Chian Wu and Chih-Yuan Chu of Taiwan came 3rd. The 470 Class of 10 competitors entirely from Hong Kong was headed by Cheung Ka Ho and Tse Siu Kit of the Hong Kong Sailing Federation with Hong Kong Sailing Society sailors Kwan Wing Ho and Lam Wing Cun 2nd and Tse Sui Lun and Chik Ho Yin 3rd. The impressive Hobbie 16 Class was won by Chan Kwok Hung and Gary Ku with Yao-Hsien Chang and Cinh-Hsu of Taiwan 2nd and Lai Ka Kai and Bnedy Lee was 3rd. Competitors in the windsurfing classes RS1, RSX, Techno 293 were all from the Wind Surfing Association of Hong Kong and the 2.4 Metre Class competitors were from the SHK Club. Windsurfing started off with fairly basic equipment, but the latest gear is highly sophisticated as are the suits worn by the competitors producing a very pleasant sailing experience. But although the youngsters look fit and strong, hauling the equipment out of the water was seen to be quite a task.